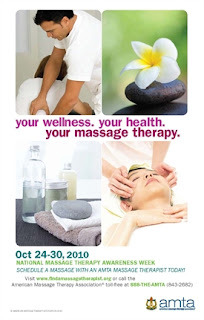 National Massage Therapy Awareness Week is October 24-30 this year! The Mending Hands blog invites you to peruse over a year's worth of massage info collected and celebrated in the name of love for massage therapy! Check out loads of info here at The Rub Down. Mending Hands Massage Therapy is also celebrating your massage this week by offering clients $10 off their session when they mention this offer. Some appointments are still available - so e-mail for your Massage Therapy Week Massage!